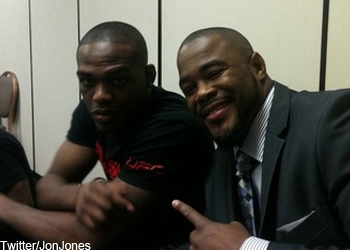 Jon Jones and Rashad Evans stood eye-to-eye inside the Octagon 11 days ago after Jones defended his light heavyweight hardware against Quinton “Rampage” Jackson at UFC 135. The next time the friends-turned-foes will stand toe-to-toe in the cage will be at UFC 140. On Wednesday, MMAFighting reported the bitter rivals will finally get to brawl on December 10th. Jones owns a nearly flawless 14-1 professional resume, with his lone blemish coming in a disqualification loss to Matt Hamill in December 2009. Since the defeat, “Bones” has rattled off five consecutive convincing victories en route to capturing the crown. This will mark the 24-year-old’s fourth fight of 2011 and his second scrap in less than three months. Jones also accepted his title fight against Mauricio “Shogun” Rua in March on just 28-days notice. Evans was last seen bumping his record to 16-1-1 after posting a lopsided TKO win over Tito Ortiz at UFC 133. Following the victory, “Suga” underwent surgery on his right hand that required pins to be inserted. Evans was scheduled to be cleared by physicians today, which blasted open the doors for the former training partners to finally settle their differences. The Air Canada Centre in Toronto will host their highly-anticipated shootout. The 205-pound title affair will headline the pay-per-view broadcast. UFC president Dana White just shot down MMAFighting’s report and said Jones vs. Evans WILL NOT be taking place at UFC 140.